Join us as we welcome Jeetendr Sehdev MBA '04, who reveals how social media stars attract such obsessive attention–even more than the Hollywood A-list. And what they can teach us about making our own ideas, products, and services break through. Jeetendr Sehdev is the world's leading celebrity expert. A trailblazer in pop culture insights, he has become one of the most prominent figures in celebrity news and a sought-after advisor to top international companies. Jeetendr's research on the power of YouTube stars continues to make global headlines and has gained him influencer status and over a million subscribers on social media. He is a familiar face on shows like Access Hollywood, The Insider and CNN Tonight and he regularly writes opinion pieces for publications like The Guardian and Forbes. A graduate of Oxford University and Harvard Business School, Jeetendr works with the United Nations helping to raise awareness and promote efforts to combat modern-day slavery. He is British national who now lives in sunny Los Angeles where he teaches at the University of Southern California. How do social media stars attract such obsessive attention--even more than the Hollywood A-list? And what can they teach us about making our own ideas, products and services break through? The world’s leading authority on celebrity branding, Jeetendr Sehdev, whom Variety calls "the best in the business," tackles these questions head on. Sehdev shows why successful images today–the most famous being Kim Kardashian–are not photoshopped to perfection, but flawed, vulnerable, and in-your-face. This total transparency generates a level of authenticity and intimacy with audiences that traditional marketing tactics just can’t touch. 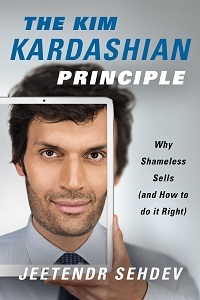 The KIM KARDASHIAN PRINCIPLE reveals the people, products and brands that do it best–from YouTube sensations like Jenna Marbles to billionaire tech mogul Elon Musk–and proves why the old strategies aren't working. After all, in a world where a big booty can break the internet, and the President-Elect is a reality TV star, self-obsession is a must-have. No posturing, no apologies, and no shying away from the spotlight. THE KIM KARDASHIAN PRINCIPLE is a fresh, provocative guide to understanding why only the boldest and baddest ideas will survive–and how to make sure yours is one of them.